Despite experiencing supply problems and suffering production errors with the rear cases of Pebble Blue handsets early on, which caused over half a million cases to be binned, Samsung says it's on course to sell 10 million of its new Galaxy S3 flagship smartphone by the end of July. 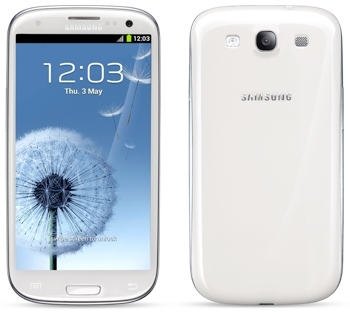 "We're getting far better reviews on S III than we did with its predecessors globally [...] and supply simply can't meet soaring demand," said JK Shin, head of Samsung's mobile division. "We've sent executives and staff to almost all our (component) suppliers to ensure a smooth offering and hopefully things will get better from next week." The handset launched in the US last Thursday with T-Mobile, AT&T and Sprint but the South Korean technology giant has struggled to keep up with demand, with 32GB models non-existent due to tight supply issues. Pebble Blue versions also continue to experience short supply due to a previous manufacturing error that resulted in over 600,000 covers being binned. By the end of July the handset will be available globally with over 300 carriers. Samsung, the world's largest phone maker by volume launched the first Galaxy S handset two years ago in a bid to counter Apple's dominant iPhone smartphone. At the time, big Sammie had a market share below 10%. Thanks to over 50 million "S" handsets now sold, and record-breaking shipments of other Samsung models the technology firm now enjoys a market share over three times larger at 30.6%. In the January to March period alone, Samsung sold 44.5 million units, an incredible 21,000 per hour. The news follows previous claims the S3 had hit nine million pre-orders ahead of its May 29 launch, but confusingly it's unknown whether the ten million estimate will be handsets sold to customers, or the same figure shipped to shops. Apple on the other hand reports the total figure of new handsets activated for the first time, giving an accurate account of exactly how many handsets are actually purchased by consumers.